We reported earlier this week that Samsung will be releasing an update for Good Lock to make it compatible with Android Pie and One UI. We can now confirm that Good Lock 2019 with Android Pie support has finally arrived. Many Good Lock fans were not excited to see that most of its apps and plugins no longer functioned properly when the One UI beta was released for the Galaxy S9 last year. The development team later confirmed that they were working to make Good Lock compatible with Android Pie. For those who are unaware, Good Lock provides users with an array for customizable features for their handset. The first ever Good Lock app was released in 2016 with compatibility for Android 6.0 Marshmallow. Samsung then updated the app in 2018 with support for Android 8.0. 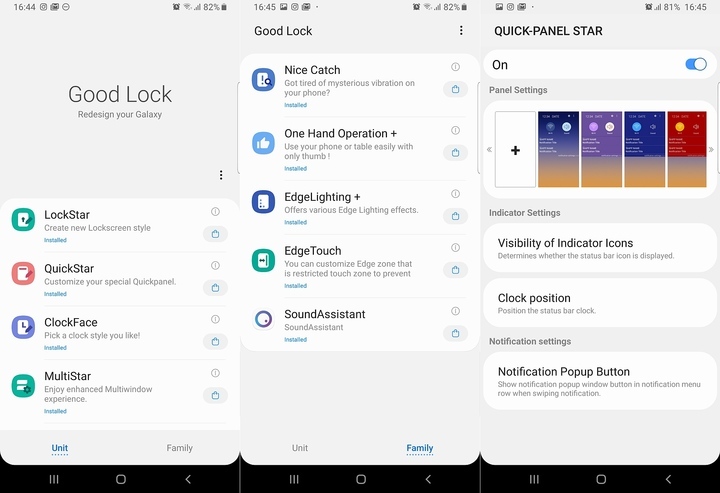 The core features in Good Lock include Quickstar, Lockstar, Task Changer, Routines, Clockface, Edge Touch, Edge Lighting and more. The development team has said that the updated version brings some improvements for these features as well. Task Changer gets new styles for recent apps while MultiStar enables some of the Multi Window functionality that was removed from Pie due to some Google policy. Much of the functionality remains the same so you’ll be familiar with it if you have used Good Lock 2018. Good Lock 2019 does not remove geographical restrictions. It’s only available to users in the United States, South Korea, Australia, Singapore, Canada, and the United Kingdom. Samsung’s list of supported markets isn’t complete but some other markets like India do have it as well. It can be downloaded there from the Galaxy Store. You can get the Good Lock 2019 APK from our database, though. If you’re in an unsupported market, you will need to download and install the Good Lock APK and the APK file for all of its plugins. You will also have to manually enable Good Lock apps. Follow this guide we wrote for Good Lock 2018. The procedure remains the same, just use the latest APKs. Do keep in mind that Good Lock 2019 with Android Pie support is available for the Galaxy Note 9 and older flagships running Pie. It does not work with the Galaxy S10 currently. An update will be released later with support for the new flagship series. Those who have Good Lock installed already can update from within the app or get the APKs and install them manually. i’ve tried to like good lock, but i always just uninstall it. if you can’t get it you’re not missing much. Anyone know how Multi Star has changed and what the restrictions are in the updated Google policy? Guessing it prevents some apps from running in pop up mode. I do like the restored ability to move the clock back to the right in QuickStar. I disabled Task Changer because it is not compatible with the navigation gesture in OneUI that enables lateral scrolling among running apps. Additional clock faces on the AOD are nice (but far from essential). The rest does little for me and probably won’t be used. They work somewhat fine, but they need to be polished. For example, if you use Quickstar you’ll notice that with a dark or transparent theme some notifications cannot be read properly. When using it without Lockstar, it interferes with the notifications in the lock screen and they become impossible to see, especially with a light wallpaper. Plus, after a reboot the quick toggles keep the theme but the notifications go white again…. Alot of it is so buggy. Conflicts with the settings on the phone and some of it doesn’t work properly. It’s not available here, but after spending a lot of time setting up Good Lock last year, I was pretty unimpressed by it. It should be more widely available for those who want it though. I cannot understand why there are geographical restrictions. Either way, I wouldn’t use it. It’s nothing special. How to download Activity Manager. It’s not available in Google Play Store. It is, open the playstore app and search for it – changed icon, etc, but does the job. You will have to open individual apps tho (after you create shortcuts for their settings to the home screen via activity manager) as the “good lock” will just spit network error and will not work. Does this 2019 version also work with phones on Oreo, such as the S7? In Belgium, Good Lock gives a network error. ClockFace sets new clock but after reboot lockscreen clock goes back to default clock and I need to repeat the change. Tasker, EdgeLight and navstar all work ok.
How does the Routines thing work? I have tried to set up a few times and it says more information needed. I have tried turning it on in the car with Bluetooth and sorts but no luck? any advice on how to get this going, please? Task Changer has been updated for me with new Layout Types and One UI design, though my phone is running Oreo. LockStar and QuickStar have remained the same, however. How do Routines work? any ideas? Read the linked in the post article how to make shortcuts for the different good lock 2019 apps. You need to open them to change things. Same for me, I open directly the apps, i.e. multistar. Still not released, maybe for the s10 compatibility that will come on a later date. Task changer and routine isn’t there yet and it sux that you have to download apks and install it all 1by1 instead of getting from Samsung store like other region, feels like Samsung is racist some how by preferring some and ignoring others. Don’t work. I have “There was a network or server error….”. I already testing new version and I don’t see ability to create app pair and add it to home screen. I think you don’t broke update with this. It’s there, in the mid menu that is enabled between two split screened apps. The first icon from the left to right. Just tested it, it’s working. Where is task changer ? I guess it will come with the S10 update.. The region restriction is a form of discrimination. Seriously, not only US gets the better snapdragon variant, but also they get officially the good lock to customise their phones further without installing APKs and so on. Great of you that you provide the APKs tho as you are trusted source.